Malaria in humans is caused by protozoan parasites of the genus Plasmodium: Plasmodium falciparum, P. vivax, P. ovale, or P. malariae. In addition, P. knowlesi, a parasite of Old World (Eastern Hemisphere) monkeys, has been documented as a cause of human infections and some deaths in Southeast Asia. All species are transmitted by the bite of an infective female Anopheles mosquito. Occasionally, transmission occurs by blood transfusion, organ transplantation, needle sharing, or congenitally from mother to fetus. Malaria is a major international public health problem, causing an estimated 214 million infections worldwide and 438,000 deaths in 2015, according to the World Health Organization (WHO) World Malaria Report 2015. Although these numbers are decreasing, the numbers of cases of malaria in travelers has been increasing. On average, 29 additional cases have been reported in the United States each year since 1973. Despite the apparent progress in reducing the global prevalence of malaria, many areas remain malaria endemic, and the use of prevention measures by travelers is still inadequate. Information about malaria transmission in specific countries (see Yellow Fever & Malaria Information, by Country later in this chapter) is derived from various sources, including WHO. The information presented herein was accurate at the time of publication; however, factors that can change rapidly and from year to year (such as local weather conditions, mosquito vector density, and prevalence of infection) can markedly affect local malaria transmission patterns. Updated information may be found on the CDC website at www.cdc.gov/malaria. Malaria transmission occurs in large areas of Africa, Latin America, parts of the Caribbean, Asia (including South Asia, Southeast Asia, and the Middle East), Eastern Europe, and the South Pacific (Maps 3-09 and 3-10). The risk for acquiring malaria differs substantially from traveler to traveler and from region to region, even within a single country. This variability is a function of the intensity of transmission within the various regions and the itinerary, duration, season, and type of travel. In 2013, >1,700 cases of malaria (including 10 deaths) diagnosed in the United States and its territories were reported to CDC. Of these, 82% were acquired in Africa, 11% in Asia, 6% in the Caribbean and the Americas, and 1% in Oceania. Malaria is characterized by fever and influenza-like symptoms, including chills, headache, myalgias, and malaise; these symptoms can occur at intervals. Uncomplicated disease may be associated with anemia and jaundice. In severe disease, seizures, mental confusion, kidney failure, acute respiratory distress syndrome, coma, and death may occur. Malaria symptoms can develop as early as 7 days (usually ≥14 days) after initial exposure in a malaria-endemic area and as late as several months or more after departure. Suspected or confirmed malaria, especially P. falciparum, is a medical emergency, requiring urgent intervention as clinical deterioration can occur rapidly and unpredictably. See Box 3-02 detailing some clinical highlights for malaria. Travelers who have symptoms of malaria should seek medical evaluation as soon as possible. Clinicians should consider malaria in any patient with a febrile illness who has recently returned from a malaria-endemic country. Malaria is a nationally notifiable disease. Smear microscopy remains the gold standard for malaria diagnosis. Microscopy can also be used to determine the species of malaria parasite, identify the parasite life-cycle stages present, and quantify the parasitemia—all of which are necessary for providing the most appropriate treatment. Microscopy results should ideally be available within a few hours. It is an unacceptable practice to send these tests to an offsite laboratory or batch them for results to be provided days later. Various test kits are available to detect antigens derived from malaria parasites. Such immunologic (immunochromatographic) tests most often use a dipstick or cassette format and provide results in 2–15 minutes. These rapid diagnostic tests (RDTs) offer a useful alternative to microscopy in situations where reliable microscopic diagnosis is not immediately available. Although RDTs can detect malaria antigens within minutes, most cannot distinguish between all 5 of the species that affect humans, they are less sensitive than expert microscopy or PCR for diagnosis, they cannot quantify parasitemia, and many will persist with a positive result for days or weeks after an infection has been treated and cleared. In addition, CDC recommends that positive and negative RDT results always be confirmed by microscopy in US health care settings. Although confirmation does not have to occur simultaneously with the RDT, the information from microscopy, including the actual presence of malaria parasites, the species, life-cycle stages (asexual vs sexual blood-stage forms), and parasitemia will be most useful if it is available as soon as possible. The Food and Drug Administration (FDA) has approved 1 RDT for use in the United States by hospital and commercial laboratories, not by individual clinicians or by patients themselves. This RDT is called BinaxNOW Malaria test. Laboratories that do not provide in-house on-the-spot microscopy services should maintain a stock of malaria RDTs so that they will be able to perform malaria diagnostic testing when needed. PCR tests are also available for detecting malaria parasites. Although these tests are more sensitive than routine microscopy, results are not usually available as quickly as microscopy results should be, thus limiting the utility of this test for acute diagnosis. PCR testing is most useful for definitively identifying the species of malaria parasite and detecting mixed infections. Species confirmation by PCR is available at the CDC malaria laboratory. In sub-Saharan Africa, clinical overdiagnosis and the rate of false-positive microscopy for malaria may be high. Travelers to this region should be warned they may be diagnosed with malaria incorrectly, even though they are taking a reliable antimalarial regimen. In such cases, acutely ill travelers should be advised to seek the best available medical services and follow the treatment offered locally (except the use of halofantrine, which is not recommended; see below) but not to stop their chemoprophylaxis regimen. Overdose of antimalarial drugs, particularly chloroquine, can be fatal. Medication should be stored in childproof containers out of the reach of infants and children. Chemoprophylaxis can be started earlier if there are particular concerns about tolerating a medication. For example, mefloquine can be started 3–4 weeks in advance to allow potential adverse events to occur before travel. If unacceptable side effects develop, there would be time to change the medication before the traveler’s departure. The drugs used for antimalarial chemoprophylaxis are generally well tolerated. However, side effects can occur. Minor side effects usually do not require stopping the drug. Travelers who have serious side effects should see a clinician who can determine if their symptoms are related to the medicine and make a medication change. In comparison with drugs with short half-lives, which are taken daily, drugs with longer half-lives, which are taken weekly, offer the advantage of a wider margin of error if the traveler is late with a dose. For example, if a traveler is 1–2 days late with a weekly drug, prophylactic blood levels can remain adequate; if the traveler is 1–2 days late with a daily drug, protective blood levels are less likely to be maintained. In those who are G6PD deficient, primaquine can cause hemolysis, which can be fatal. Be sure to document a normal G6PD level before prescribing primaquine. Travelers should be informed that malaria could be fatal if treatment is delayed. Medical help should be sought promptly if malaria is suspected, and a blood sample should be taken and examined for malaria parasites on 1 or more occasions. Travelers should also be informed that malaria could be fatal even when treated, which is why it is always preferable to prevent malaria cases rather than rely on treating infections after they occur. Malaria smear results or a rapid diagnostic test must be available immediately (within a few hours). Sending specimens to offsite laboratories where results are not available for extended periods of time (days) is not acceptable. If a patient has an illness suggestive of severe malaria and a compatible travel history in an area where malaria transmission occurs, it is advisable to start treatment as soon as possible, even before the diagnosis is established. CDC recommendations for malaria treatment can be found at www.cdc.gov/malaria/diagnosis_treatment/index.html. Malaria can be treated effectively early in the course of the disease, but delay of therapy can have serious or even fatal consequences. Travelers who have symptoms of malaria should be advised to seek medical evaluation as soon as possible. Specific treatment options depend on the species of malaria, the likelihood of drug resistance (based on where the infection was acquired), the age of the patient, pregnancy status, and the severity of infection. Detailed CDC recommendations for malaria treatment can be found at www.cdc.gov/malaria/diagnosis_treatment/treatment.html. Clinicians who require assistance with the diagnosis or treatment of malaria should call the CDC Malaria Hotline (770-488-7788 or toll-free at 855-856-4713 ) from 9 am to 5 pm Eastern Time. After hours or on weekends and holidays, clinicians requiring assistance should call the CDC Emergency Operations Center at 770-488-7100 and ask the operator to page the person on call for the Malaria Branch. In addition, it is advisable to consult with a clinician who has specialized travel or tropical medicine expertise or with an infectious disease physician. Medications that are not used in the United States for the treatment of malaria, such as halofantrine, are widely available overseas. CDC does not recommend halofantrine for treatment because of cardiac adverse events, including deaths, which have been documented after treatment. These adverse events have occurred in people with and without preexisting cardiac problems and both in the presence and absence of other antimalarial drugs (such as mefloquine). Travelers who reject the advice to take prophylaxis, who choose a suboptimal drug regimen (such as chloroquine in an area with chloroquine-resistant P. falciparum), or who require a less-than-optimal drug regimen for medical reasons are at increased risk for acquiring malaria and needing prompt treatment while overseas. In addition, some travelers who are taking effective prophylaxis but who will be in remote areas may decide, in consultation with their travel health provider, to take along a reliable supply of a full course of an approved malaria treatment regimen (see Box 3-03 for a definition of reliable supply). In the event that they are diagnosed with malaria, they will have immediate access to this treatment regimen, which if acquired in the United States is unlikely to be counterfeit and will not deplete local resources. In rare instances when access to medical care is not available and the traveler develops a febrile illness consistent with malaria, the reliable supply medication can be self-administered presumptively. Travelers should be advised that this self-treatment of a possible malarial infection is only a temporary measure and that prompt medical evaluation is imperative. Two malaria treatment regimens available in the United States can be prescribed as a reliable supply: atovaquone-proguanil and artemetherlumefantrine. The use of the same or related drugs that have been taken for prophylaxis is not recommended to treat malaria. For example, atovaquone-proguanil may be used as a reliable supply medication by travelers not taking atovaquone-proguanil for prophylaxis. See Table 3-08 for the dosing recommendation. The goal of these malaria prevention guidelines is to prevent malaria caused by all species, not only P. falciparum. These guidelines apply to both short-term and long-term travelers. Malaria prevention consists of a combination of mosquito avoidance measures and chemoprophylaxis. Although effi-cacious, the recommended interventions are not 100% effective. Preventing malaria involves striking a balance between ensuring that all people at risk for infection use the recommended prevention measures, while preventing rare occurrences of adverse effects of these interventions among people using them unnecessarily. An individual risk assessment should be conducted for every traveler, taking into account not only the destination country but also the detailed itinerary, including specific cities, types of accommodation, season, and style of travel. In addition, conditions such as pregnancy or antimalarial drug resistance at the destination may modify the risk assessment. Depending on the level of risk, it may be appropriate to recommend no specific interventions, mosquito avoidance measures only, or mosquito avoidance measures plus chemoprophylaxis. For areas of intense transmission, such as West Africa, exposure for even short periods of time can result in transmission, so travelers to this area should be considered at high risk for infection. Malaria transmission is not distributed homogeneously throughout all countries. Some destinations have malaria transmission occurring only in certain areas. If travelers are going to high-transmission areas during peak transmission times, even though the country as a whole may have relatively low malaria transmission, they may be at high risk for infection while there. Geography is just a part of determining a traveler’s risk for infection. Risk can differ substantially for different travelers as their behaviors and circumstances differ. For example, travelers staying in air-conditioned hotels may be at lower risk than backpackers or adventure travelers. Similarly, long-term residents living in screened and air-conditioned housing are less likely to be exposed than are people living without such amenities. The highest risk is associated with first- and second-generation immigrants living in non-endemic countries who return to their countries of origin to visit friends and relatives (VFRs). VFR travelers often consider themselves to be at no risk, because they grew up in a malarious country and consider themselves immune. However, acquired immunity is lost quickly, and VFRs should be considered to have the same risk as other nonimmune travelers (see Chapter 8, Immigrants Returning Home to Visit Friends & Relatives [VFRs]). Travelers should also be reminded that even if a person has had malaria before, he or she can get it again, and preventive measures are still necessary. Because of the nocturnal feeding habits of Anopheles mosquitoes, malaria transmission occurs primarily between dusk and dawn. Contact with mosquitoes can be reduced by remaining in well-screened areas, using mosquito bed nets (preferably insecticide-treated nets), using an effective insecticide spray in living and sleeping areas during evening and nighttime hours, and wearing clothes that cover most of the body. All travelers should use an effective mosquito repellent (see Chapter 2, Protection against Mosquitoes, Ticks, & Other Arthropods). Repellents should be applied to exposed parts of the skin when mosquitoes are likely to be present. If travelers are also wearing sunscreen, sunscreen should be applied first and insect repellent second. In addition to using a topical insect repellent, a permethrin-containing product may be applied to bed nets and clothing for additional protection against mosquitoes. All recommended primary chemoprophylaxis regimens involve taking a medicine before, during, and after travel to an area with malaria. Beginning the drug before travel allows the antimalarial agent to be in the blood before the traveler is exposed to malaria parasites. In choosing a chemoprophylaxis regimen before travel, the traveler and the travel health provider should consider several factors. The travel itinerary should be reviewed in detail and compared with information on where malaria transmission occurs within a given country, to determine whether the traveler will be traveling in a part of the country where malaria occurs and if antimalarial drug resistance has been reported in that location (see the Yellow Fever & Malaria Information, by Country section later in this chapter). Additional factors to consider are the patient’s other medical conditions, medications being taken (to assess potential drug interactions), the cost of the medicines, and the potential side effects. Table 3-09 lists some of the benefits and limitations of medicines used for malaria chemoprophylaxis; additional information about choosing a malaria chemoprophylaxis regimen can be found at www.cdc.gov/malaria/travelers/drugs.html. 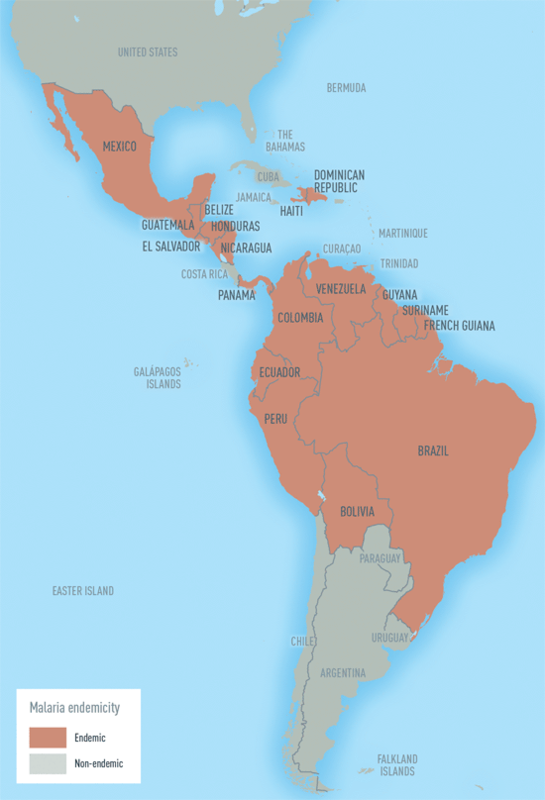 The resistance of P. falciparum to chloroquine has been confirmed in all areas with P. falciparum malaria except the Caribbean, Central America west of the Panama Canal, and some countries in the Middle East. In addition, resistance to sulfadoxine-pyrimethamine is widespread in the Amazon River Basin area of South America, much of Southeast Asia, other parts of Asia, and in large parts of Africa. Resistance to mefloquine has been confirmed on the borders of Thailand with Burma (Myanmar) and Cambodia, in the western provinces of Cambodia, in the eastern states of Burma on the border between Burma and China, along the borders of Laos and Burma, the adjacent parts of the Thailand–Cambodia border, and in southern Vietnam. The resistance of P. vivax to chloroquine has been confirmed in Papua New Guinea and Indonesia. In addition to primary prophylaxis, presumptive antirelapse therapy (also known as terminal prophylaxis) uses a medication toward the end of the exposure period (or immediately thereafter) to prevent relapses or delayed-onset clinical presentations of malaria caused by hypnozoites (dormant liver stages) of P. vivax or P. ovale. Because most malarious areas of the world (except the Caribbean) have at least 1 species of relapsing malaria, travelers to these areas have some risk for acquiring either P. vivax or P. ovale, although the actual risk for an individual traveler is difficult to define. Presumptive antirelapse therapy is generally indicated only for people who have had prolonged exposure in malaria-endemic areas (such as missionaries, military personnel, or Peace Corps volunteers). The medications recommended for chemoprophylaxis of malaria may also be available at overseas destinations. However, combinations of these medications and additional drugs that are not recommended may be commonly prescribed and used in other countries. Travelers should be strongly discouraged from obtaining chemoprophylaxis medications while abroad. The quality of these products is not known; they may not be protective and could be dangerous. These medications may have been produced by substandard manufacturing practices, may be counterfeit, or may contain contaminants. Additional information on this topic can be found in Chapter 2, Perspectives: Pharmaceutical Quality & Falsified Drugs, and on the FDA website (www.fda.gov/Drugs/ResourcesForYou/Consumers/BuyingUsingMedicineSafely/BuyingMedicinefromOutsidetheUnitedStates/default.htm). Atovaquone-proguanil is a fixed combination of the drugs atovaquone and proguanil. Prophylaxis should begin 1–2 days before travel to malarious areas and should be taken daily, at the same time each day, while in the malarious areas, and daily for 7 days after leaving the areas (see Table 3-10 for recommended dosages). Atovaquone-proguanil is well tolerated, and side effects are rare. The most common adverse effects reported in people using atovaquone-proguanil for prophylaxis or treatment are abdominal pain, nausea, vomiting, and headache. Atovaquone-proguanil is not recommended for prophylaxis in children weighing <5 kg (11 lb), pregnant women, or patients with severe renal impairment (creatinine clearance <30 mL/min). Proguanil may increase the effect of warfarin, so international normalized ratio monitoring or dosage adjustment may be needed. 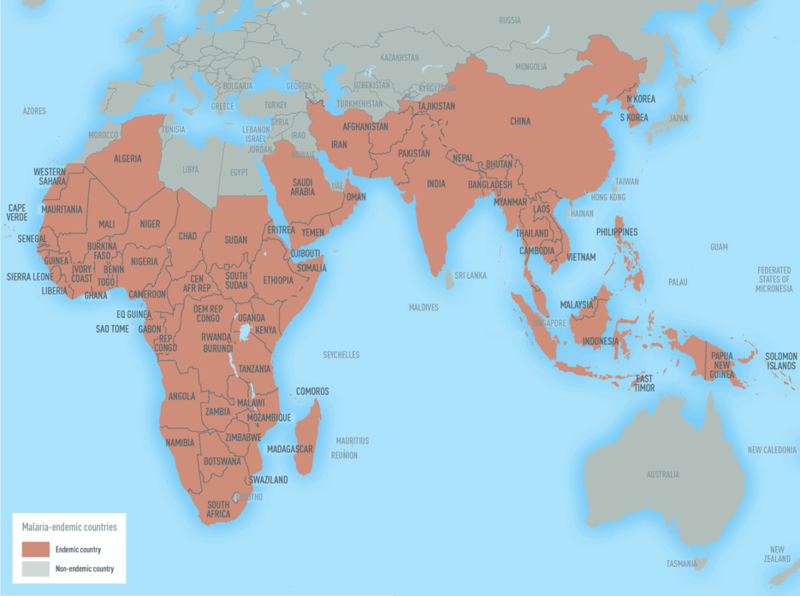 Chloroquine phosphate or hydroxychloroquine sulfate can be used for prevention of malaria only in destinations where chloroquine resistance is not present (see Maps 3-09 and 3-10 and the Yellow Fever & Malaria Information, by Country section later in this chapter). Prophylaxis should begin 1– 2 weeks before travel to malarious areas. It should be continued by taking the drug once a week, on the same day of the week, during travel in malarious areas and for 4 weeks after a traveler leaves these areas (see Table 3-10 for recommended dosages). Reported side effects include gastrointestinal disturbance, headache, dizziness, blurred vision, insomnia, and pruritus, but generally these effects do not require that the drug be discontinued. High doses of chloroquine, such as those used to treat rheumatoid arthritis, have been associated with retinopathy; this serious side effect appears to be extremely unlikely when chloroquine is used for routine weekly malaria prophylaxis. Chloroquine and related compounds have been reported to exacerbate psoriasis. People who experience uncomfortable side effects after taking chloroquine may tolerate the drug better by taking it with meals. As an alternative, the related compound hydroxychloroquine sulfate may be better tolerated. Doxycycline prophylaxis should begin 1–2 days before travel to malarious areas. It should be continued once a day, at the same time each day, during travel in malarious areas and daily for 4 weeks after the traveler leaves such areas. Insufficient data exist on the antimalarial prophylactic efficacy of related compounds such as minocycline (commonly prescribed for the treatment of acne). People on a long-term regimen of minocycline who need malaria prophylaxis should stop taking minocycline 1–2 days before travel and start doxycycline instead. Minocycline can be restarted after the full course of doxycycline is completed (see Table 3-10 for recommended dosages). Doxycycline can cause photosensitivity, usually manifested as an exaggerated sunburn reaction. The risk for such a reaction can be minimized by avoiding prolonged, direct exposure to the sun and by using sunscreen. In addition, doxycycline use is associated with an increased frequency of vaginal yeast infections. Gastrointestinal side effects (nausea or vomiting) may be minimized by taking the drug with a meal or by specifically prescribing doxycycline monohydrate or the enteric-coated doxycycline hyclate, rather than the generic doxycycline hyclate, which is often less expensive. To reduce the risk for esophagitis, travelers should be advised to swallow the medicine with sufficient fluids and not to take doxycycline before going to bed. Doxycycline is contraindicated in people with an allergy to tetracyclines, during pregnancy, and in infants and children aged <8 years. Vaccination with the oral typhoid vaccine Ty21a should be delayed for ≥24 hours after taking a dose of doxycycline. Mefloquine prophylaxis should begin ≥2 weeks before travel to malarious areas. It should be continued once a week, on the same day of the week, during travel in malarious areas and for 4 weeks after a traveler leaves such areas (see Table 3-10 for recommended dosages). Mefloquine has been associated with rare but serious adverse reactions (such as psychoses or seizures) at prophylactic doses; these reactions are more frequent with the higher doses used for treatment. Other side effects that have occurred in chemoprophylaxis studies include gastrointestinal disturbance, headache, insomnia, abnormal dreams, visual disturbances, depression, anxiety disorder, and dizziness. Other more severe neuropsychiatric disorders occasionally reported during postmarketing surveillance include sensory and motor neuropathies (including paresthesia, tremor, and ataxia), agitation or restlessness, mood changes, panic attacks, forgetfulness, confusion, hallucinations, aggression, paranoia, and encephalopathy. On occasion, psychiatric symptoms have been reported to continue long after mefloquine has been stopped. FDA also includes a boxed warning about rare reports of persistent dizziness after mefloquine use. Mefloquine is contraindicated for use by travelers with a known hypersensitivity to mefloquine or related compounds (such as quinine or quinidine) and in people with active depression, a recent history of depression, generalized anxiety disorder, psychosis, schizophrenia, other major psychiatric disorders, or seizures. It should be used with caution in people with psychiatric disturbances or a history of depression. A review of available data suggests that mefloquine may be used safely in people concurrently on β-blockers, if they have no underlying arrhythmia. However, mefloquine is not recommended for people with cardiac conduction abnormalities. Any traveler receiving a prescription for mefloquine must also receive a copy of the FDA medication guide, which can be found at www.accessdata.fda.gov/drugsatfda_docs/label/2008/019591s023lbl.pdf. Primaquine phosphate has 2 distinct uses for malaria prevention: primary prophylaxis in areas with primarily P. vivax and presumptive antirelapse therapy (terminal prophylaxis). When taken for primary prophylaxis, primaquine should be taken 1–2 days before travel to malarious areas, daily, at the same time each day, while in the malarious areas, and daily for 7 days after leaving the areas (see Table 3-10 for recommended dosages). Primary prophylaxis with primaquine obviates the need for presumptive antirelapse therapy. When used for presumptive antirelapse therapy, primaquine is administered for 14 days after the traveler has left a malarious area. When chloroquine, doxycycline, or mefloquine is used for primary prophylaxis, primaquine is usually taken during the last 2 weeks of postexposure prophylaxis. When atovaquone-proguanil is used for prophylaxis, primaquine may be taken during the final 7 days of atovaquone-proguanil, and then for an additional 7 days. Primaquine should be given concurrently with the primary prophylaxis medication. However, if that is not feasible, the primaquine course should still be administered after the primary prophylaxis medication has been completed. The most common adverse event in people with normal G6PD levels is gastrointestinal upset if primaquine is taken on an empty stomach. This problem is minimized or eliminated if primaquine is taken with food. In G6PD-deficient people, primaquine can cause hemolysis that can be fatal. Before primaquine is used, G6PD deficiency MUST be ruled out by laboratory testing. For destinations where malaria cases occur sporadically and risk for infection to travelers is assessed as being low, CDC recommends that travelers use mosquito avoidance measures only, and no chemoprophylaxis should be prescribed (see the Yellow Fever & Malaria Information, by Country section later in this chapter). For destinations where the main species of malaria present is P. vivax, in addition to mosquito avoidance measures, primaquine is a good choice for primary prophylaxis for travelers who are not G6PD deficient. Its use for this indication is considered off-label in the United States. The predominant species of malaria and the recommended chemoprophylaxis medicines are listed in the Yellow Fever & Malaria Information, by Country section later in this chapter. For people unable to take primaquine, other drugs can be used as described below, depending on the presence of antimalarial drug resistance. For destinations where chloroquine-sensitive malaria is present, in addition to mosquito avoidance measures, the many effective chemoprophylaxis options include chloroquine, atovaquone-proguanil, doxycycline, mefloquine, and in some instances, primaquine for travelers who are not G6PD deficient. Longer-term travelers may prefer the convenience of weekly chloroquine, while shorter-term travelers may prefer the shorter course of atovaquone-proguanil or primaquine. For destinations where chloroquine-resistant malaria is present, in addition to mosquito avoidance measures, chemoprophylaxis options are atovaquone-proguanil, doxycycline, and mefloquine. For destinations where mefloquine-resistant malaria is present, in addition to mosquito avoidance measures, chemoprophylaxis options are either atovaquone-proguanil or doxycycline. Infants of any age or weight or children and adolescents of any age can contract malaria. Therefore, all children traveling to malaria-endemic areas should use the recommended prevention measures, which often include taking an antimalarial drug. In the United States, antimalarial drugs are available only in oral formulations and may taste bitter. Pediatric doses should be carefully calculated according to body weight but should never exceed adult dose. Pharmacists can pulverize tablets and prepare gelatin capsules for each measured dose. If the child is unable to swallow the capsules or tablets, parents should prepare the child’s dose of medication by breaking open the gelatin capsule and mixing the drug with a small amount of something sweet, such as applesauce, chocolate syrup, or jelly, to ensure the entire dose is delivered to the child. Giving the dose on a full stomach may minimize stomach upset and vomiting. Chloroquine and mefloquine are options for use in infants and children of all ages and weights, depending on drug resistance at their destination. Primaquine can be used for children who are not G6PD deficient traveling to areas with principally P. vivax. Doxycycline may be used for children who are aged ≥8 years. Atovaquone-proguanil may be used for prophylaxis for infants and children weighing ≥5 kg (11 lb). Prophylactic dosing for children weighing <11 kg (24 lb) constitutes off-label use in the United States. Pediatric dosing regimens are contained in Table 3-10. Malaria infection in pregnant women can be more severe than in non-pregnant women. Malaria increases the risk for adverse pregnancy outcomes, including prematurity, spontaneous abortion, and stillbirth. For these reasons, and because no chemoprophylaxis regimen is completely effective, women who are pregnant or likely to become pregnant should be advised to avoid travel to areas with malaria transmission if possible (see Chapter 8, Pregnant Travelers). If travel to a malarious area cannot be deferred, use of an effective chemoprophylaxis regimen is essential. Pregnant women traveling to areas where chloroquine-resistant P. falciparum has not been reported may take chloroquine prophylaxis. Chloroquine has not been found to have any harmful effects on the fetus when used in the recommended doses for malaria prophylaxis; therefore, pregnancy is not a contraindication for malaria prophylaxis with chloroquine phosphate or hydroxychloroquine sulfate. For travel to areas where chloroquine resistance is present, mefloquine is the only medication recommended for malaria chemoprophylaxis during pregnancy. In 2011, the FDA reviewed available data for mefloquine use during pregnancy and reclassified it from category C (animal reproduction studies have shown an adverse effect on the fetus and there are no adequate and well-controlled studies in humans, but potential benefits may warrant use of the drug in pregnant women despite potential risks) to category B (animal reproduction studies have failed to demonstrate a risk to the fetus and there are no adequate and well-controlled studies in pregnant women). Experts are investigating ways to examine the safety of atovaquone-proguanil use during pregnancy. Proguanil has been used for decades in pregnant women; however, until such time as these data are fully evaluated, atovaquoneproguanil is not recommended for use during pregnancy. Doxycycline is contraindicated for malaria prophylaxis during pregnancy because of the risk for adverse effects seen with tetracycline, a related drug, on the fetus, which include discoloration and dysplasia of the teeth and inhibition of bone growth. Primaquine should not be used during pregnancy because the drug may be passed transplacentally to a G6PD-deficient fetus and cause hemolytic anemia in utero. Women planning to become pregnant may use the same medications that are recommended for use during pregnancy. CDC does not recommend that women planning pregnancy wait a specific period of time after the use of malaria chemoprophylaxis medicines before becoming pregnant. However, if women or their health care providers wish to decrease the amount of antimalarial drug in the body before conception, Table 3-11 provides information on the half-lives of the recommended malara chemoprophylaxis medicines. After 2, 4, and 6 half-lives, approximately 25%, 6%, and 2% respectively, of the drug remain in the body. Very small amounts of antimalarial drugs are excreted in the breast milk of lactating women. Because the quantity of antimalarial drugs transferred in breast milk is insufficient to provide adequate protection against malaria, infants who require chemoprophylaxis must receive the recommended dosages of antimalarial drugs listed in Table 3-10. Because chloroquine and mefloquine may be safely prescribed to infants, it is also safe for infants to be exposed to the small amounts excreted in breast milk. Although data are very limited about the use of doxycycline in lactating women, most experts consider the theoretical possibility of adverse events to the infant to be remote. Although no information is available on the amount of primaquine that enters human breast milk, the mother and infant should be tested for G6PD deficiency before primaquine is given to a woman who is breastfeeding. Because data are not yet available on the safety of atovaquoneproguanil prophylaxis in infants weighing <5 kg (11 lb), CDC does not recommend it to prevent malaria in women breastfeeding infants weighing <5 kg. However, it can be used to treat women who are breastfeeding infants of any weight when the potential benefit outweighs the potential risk to the infant (such as treating a breastfeeding woman who has acquired P. falciparum malaria in an area of multidrug-resistant strains and who cannot tolerate other treatment options). Recommendations for drugs to prevent malaria differ by country of travel and can be found in the Yellow Fever & Malaria Information, by Country section later in this chapter. Recommended drugs for each country are listed in alphabetical order and have comparable efficacy in that country. No antimalarial drug is 100% protective; therefore, prophylaxis must be combined with the use of personal protective measures (such as insect repellent, long sleeves, long pants, sleeping in a mosquito-free setting or using an insecticide-treated bed net). When several different drugs are recommended for an area, Table 3-09 may help in the decision-making process. Medications recommended for prophylaxis against malaria have different modes of action that affect the parasites at different stages of the life cycle. Thus, if the medication needs to be changed because of side effects before a full course has been completed, there are some special considerations (see Table 3-12). One tablet contains 20 mg artemether and 120 mg lumefantrine. A 3-day treatment schedule with a total of 6 oral doses is recommended for both adult and pediatric patients based on weight. The patient should receive the initial dose, followed by the second dose 8 hours later, then 1 dose twice per day for the following 2 days. 1If used for presumptive self-treatment, medical care should be sought as soon as possible. Good for last-minute travelers because the drug is started 1–2 days before travel. Good choice for shorter trips because the traveler takes the medicine for only 7 days after traveling rather than 4 weeks. Pediatric tablets are available and may be more convenient. Cannot be used by women who are pregnant or breastfeeding a child that weighs <5 kg. Cannot be taken by people with severe renal impairment. Tends to be more expensive than some of the other options (especially for long trips). Some people (including children) would rather not take a medicine every day. Some people would rather take medicine weekly. Good choice for long trips because it is taken only weekly. Some people are already taking hydroxychloroquine chronically for rheumatologic conditions; in those instances, they may not have to take an additional medicine. Can be used in all trimesters of pregnancy. Cannot be used in areas with chloroquine or mefloquine resistance. Some people would rather not take a weekly medication. For short trips, some people would rather not take medication for 4 weeks after travel. Not a good choice for last-minute travelers, because drug needs to be started 1–2 weeks before travel. Tends to be the least expensive antimalarial. People who are already taking doxycycline chronically to prevent acne do not have to take an additional medicine. Doxycycline also can prevent some additional infections (such as rickettsial infections and leptospirosis), so it may be preferred by people planning to hike, camp, and swim in fresh water. Cannot be used by pregnant women and children aged <8 years. Some people would rather not take a medicine every day. Women prone to getting vaginal yeast infections when taking antibiotics may prefer taking a different medicine. People may want to avoid the increased risk of sun sensitivity. Some people are concerned about the potential of getting an upset stomach from doxycycline. Cannot be used in areas with mefloquine resistance. Cannot be used in patients with certain psychiatric conditions. Cannot be used in patients with a seizure disorder. Not recommended for people with cardiac conduction abnormalities. Not a good choice for last-minute travelers because drug needs to be started ≥2 weeks before travel. It is the most effective medicine for preventing P. vivax, so it is a good choice for travel to places with >90% P. vivax. Good choice for shorter trips because you only have to take the medicine for 7 days after traveling rather than 4 weeks. Cannot be used in patients with G6PD deficiency. There are costs and delays associated with getting a G6PD test; however, it only has to be done once. Once a normal G6PD level is verified and documented, the test does not have to be repeated the next time primaquine is considered. Cannot be used by pregnant women. Cannot be used by women who are breastfeeding, unless the infant has also been tested for G6PD deficiency. Some people are concerned about the potential of getting an upset stomach from primaquine. Atovaquone-proguanil Prophylaxis in all areas Adult tablets contain 250 mg atovaquone and 100 mg proguanil hydrochloride. 1 adult tablet orally, daily Pediatric tablets contain 62.5 mg atovaquone and 25 mg proguanil hydrochloride. >40 kg: 1 adult tablet daily Begin 1–2 days before travel to malarious areas. Take daily at the same time each day while in the malarious area and for 7 days after leaving such areas. Contraindicated in people with severe renal impairment (creatinine clearance <30 mL/min). Atovaquone-proguanil should be taken with food or a milky drink. Not recommended for prophylaxis for children weighing <5 kg, pregnant women, and women breastfeeding infants weighing <5 kg. Partial tablet doses may need to be prepared by a pharmacist and dispensed in individual capsules, as described in the text. Chloroquine phosphate Prophylaxis only in areas with chloroquine-sensitive malaria 300 mg base (500 mg salt) orally, once/week 5 mg/kg base (8.3 mg/kg salt) orally, once/week, up to maximum adult dose of 300 mg base Begin 1–2 weeks before travel to malarious areas. Take weekly on the same day of the week while in the malarious area and for 4 weeks after leaving such areas. May exacerbate psoriasis. Doxycycline Prophylaxis in all areas 100 mg orally, daily ≥8 years of age: 2.2 mg/kg up to adult dose of 100 mg/day Begin 1–2 days before travel to malarious areas. Take daily at the same time each day while in the malarious area and for 4 weeks after leaving such areas. Contraindicated in children <8 years of age and pregnant women. Hydroxychloroquine sulfate An alternative to chloroquine for prophylaxis only in areas with chloroquine-sensitive malaria 310 mg base (400 mg salt) orally, once/week 5 mg/kg base (6.5 mg/kg salt) orally, once/week, up to a maximum adult dose of 310 mg base Begin 1–2 weeks before travel to malarious areas. Take weekly on the same day of the week while in the malarious area and for 4 weeks after leaving such areas. >45 kg: 1 tablet once/week Begin ≥2 weeks before travel to malarious areas. Take weekly on the same day of the week while in the malarious area and for 4 weeks after leaving such areas. Contraindicated in people allergic to mefloquine or related compounds (quinine, quinidine) and in people with active depression, a recent history of depression, generalized anxiety disorder, psychosis, schizophrenia, other major psychiatric disorders, or seizures. Use with caution in people with psychiatric disturbances or a previous history of depression. Not recommended for people with cardiac conduction abnormalities. 0.5 mg/kg base (0.8 mg/kg salt) up to adult dose orally, daily for 14 days after departure from the malarious area Begin 1–2 days before travel to malarious areas. Take daily at the same time each day while in the malarious area and for 7 days after leaving such areas. Contraindicated in people with G6PD deficiency. Also contraindicated during pregnancy and lactation, unless the infant being breastfed has a documented normal G6PD level. Indicated for people who have had prolonged exposure to P. vivax, P. ovale, or both. Contraindicated in people with G6PD deficiency. Also contraindicated during pregnancy and lactation, unless the infant being breastfed has a documented normal G6PD level. 1All people who take primaquine should have a documented normal G6PD level before starting the medication. Begin doxycycline, continue daily while in malaria-endemic area, and continue for 4 weeks after leaving malaria-endemic area. If the switch occurs ≥3 weeks before departure from the endemic area, atovaquone-proguanil should be taken daily for the remainder of the stay in the endemic area and for 1 week thereafter. If the switch occurs <3 weeks before departure from the endemic area, atovaquone-proguanil should be taken daily for 4 weeks after the switch. If the switch occurs after departure from the risk area, atovaquone-proguanil should be taken daily until 4 weeks after the date of departure. Primaquine This switch would be unlikely as primaquine is only recommended for primary prophylaxis in areas with mainly P. vivax for people with normal G6PD activity. Should that be the case, begin primaquine, continue daily while in malaria-endemic area, and continue for 7 days after leaving malaria-endemic area. Atovaquone-proguanil Doxycycline Begin doxycycline, continue daily while in malaria-endemic area, and continue for 4 weeks after leaving malaria-endemic area. Chloroquine Doxycycline Begin doxycycline, continue daily while in malaria-endemic area, and continue for 4 weeks after leaving malaria-endemic area. If the switch occurs following departure from the risk area, atovaquone-proguanil should be taken daily until 4 weeks after the date of departure from the endemic area. Primaquine Doxycycline Begin doxycycline, continue daily while in malaria-endemic area, and continue for 4 weeks after leaving malaria-endemic area. Atovaquone-proguanil Begin atovaquone-proguanil, continue daily while in malaria-endemic area, and continue for 7 days after leaving malaria-endemic area. People who have been in an area where malaria transmission occurs should be deferred from donating blood in the United States for a period of time after returning from the malarious area to prevent transmission of malaria through blood transfusion (Table 3-13). Risk assessments may differ between travel health providers and blood banks. A travel health provider advising a traveler going to a country with relatively low malaria transmission for a short period of time and engaging in low-risk behaviors may choose insect avoidance only and no chemoprophylaxis for the traveler. However, upon the traveler’s return, a blood bank may still choose to defer that traveler for 1 year because of the travel to an area where transmission occurs. Travelers to malaria-endemic areas May not donate blood for 1 year after travel. Former residents of malaria-endemic areas May not donate blood for 3 years after departing. If they return to a malaria-endemic area within that 3-year period, they are deferred for an additional 3 years. People diagnosed with malaria May not donate for 3 years after treatment. Boggild AK, Parise ME, Lewis LS, Kain KC. Atovaquoneproguanil: report from the CDC expert meeting on malaria chemoprophylaxis (II). Am J Trop Med Hyg. 2007 Feb;76(2):208–23. CDC. Malaria Surveillance—United States, 2013. MMWR Surveill Summ. 2016 Mar 4;65(2):1–22. Hill DR, Baird JK, Parise ME, Lewis LS, Ryan ET, Magill AJ. Primaquine: report from CDC expert meeting on malaria chemoprophylaxis I. Am J Trop Med Hyg. 2006 Sep;75(3):402–15. Leder K, Black J, O’Brien D, Greenwood Z, Kain KC, Schwartz E, et al. Malaria in travelers: a review of the GeoSentinel surveillance network. Clin Infect Dis. 2004 Oct 15;39(8):1104–12. Newman RD, Parise ME, Barber AM, Steketee RW. Malaria-related deaths among US travelers, 1963–2001. Ann Intern Med. 2004 Oct 5;141(7):547–55. Tan KR, Magill AJ, Parise ME, Arguin PM. Doxycycline for malaria chemoprophylaxis and treatment: report from the CDC expert meeting on malaria chemoprophylaxis. Am J Trop Med Hyg. 2011 Apr;84(4):517–31.